We needed weinies. Mr Brown had weinies. It’s as simple as that. …and see the people suffering at the bottom of the capitalist heap, these days you can only really see them on TV, and even then you have to go out of your way to find out about it, and even then there’s such a long causal string between your actions and their suffering that you don’t feel responsible or potent to do anything about it. 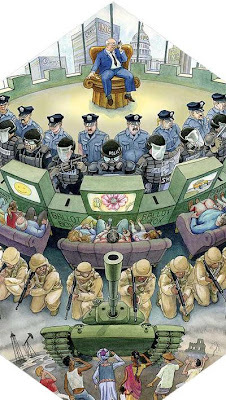 Part of that is the media, of course, which is why us Westerners are so happy to be wedged in between the soldiers and the police. 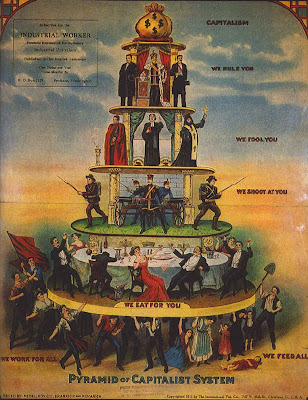 Missing from this new pyramid, I think, are the politicians, who should be standing just behind the police, as I don’t think they’re quite represented by the guy at the top (at least in New Zealand; the US is a different matter). Sorry, this is the best pic I could find. Surprisingly — stunningly, in fact — research shows that the majority of people select the first option; they would rather make twice as much as others even if that meant earning half as much as they could otherwise have. How irrational is that? 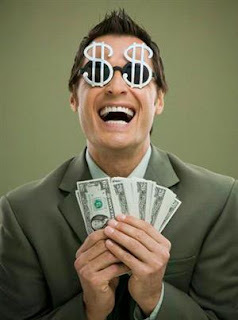 Why people believe weird things about money. Via Reddit, via Metafilter, a fascinating image of the world based on GDP per square kilometre. James Hamilton’s comments are interesting, though they do have graphs, which make me go a great big rubbery one.